Nanotechnology has been hailed as the next big thing for decades, but it is only now that it is truly becoming a reality in the medical device space. The term nanotechnology itself dates back to the 1980s when it was coined by U.S. engineer Eric Drexler. In the past few decades, nanotech has found a steadily growing number of applications in everything from computing to textiles. It remains to be seen to what extent nanotechnology will reshape medicine, but nanotech advances are continually being announced. We asked Roger Narayan, PhD, professor at the University of North Carolina/North Carolina State University Joint Department of Biomedical Engineering (Chapel Hill and Raleigh, respectively), about what areas he and his team have been examining, to get a preview of what the next crop of graduates might bring to the party. We also spoke with Chris Folk, principal engineer, Device Strategy Group at Amgen Inc. (Thousand Oaks, CA), to get his take on some other areas that bear watching. "We are focusing on two activities," Narayan said, "thin-film growth for medical device applications and 3-D printing at small scales. We are examining the deposition of ceramic thin films on medical devices using pulsed laser deposition, chemical vapor deposition, and atomic layer deposition. "We have looked at using atomic layer deposition to grow films of titanium oxide and zinc oxide in a conformal manner on nanostructured surfaces for use in medical devices. In addition, we have used chemical vapor deposition to grow a hard carbon material known as ultrananocrystalline diamond on nanostructured surfaces." Narayan said. "This is also for use in medical devices. We are examining the processing of many types of medical devices, including microneedles, both for drug delivery and for biosensing." "I find this to be a very interesting time. 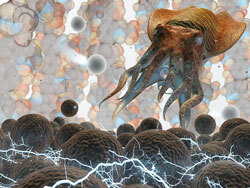 In terms of medical nanotechnology there are changes happening," Folk said. "In terms of drug delivery, there are new platforms being built. Generally, there are new ways of interacting with the body. There are a lot of challenges right now. I think there are more opportunities for innovation and more positive inertia in creative thinking than we've seen in a while, so I'm excited." "I look at the devices themselves," Folk said. "Many of them are getting smaller. 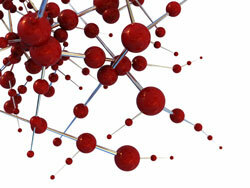 There are a bunch of different ways that nanotechnology is being involved. There's a lot going on in terms of wearables, and in the cardiovascular and diagnostics spaces." Here are 10 recent advances that could be commercialized in the relatively near future. Learn more about medical technology trends at BIOMEDevice San Jose, December 6-7. Nanotech could end up providing a solution to the need for bulky headsets in virtual reality environments, and the answer involves contact lenses. Bellevue, WA-based Innovega with its iOptik platform embedded a center filter and display lens at the center of a contact lens. The optical elements are smaller than the eye's pupil and therefore do not interfere with vision. A projector can hit those tiny optical elements, which guide images to the retina. But the retina is still getting the overall normal vision provided through the entire pupil, so the brain ends up viewing the projected images and the overall normal field of vision as one. The company said its iOptik platform provides wearers a "virtual canvas" on which any media can be viewed or application run. The prototypes will feature up to six times the number of pixels and 46 times the screen size of mobile products that rely on designs limited by conventional optics. Those optics are said to deliver games, simulator environments, and movies that are truly "immersive" and "mimic IMAX performance," the company said. The electronics are built into a stylish pair of glasses without the bulk or weight of traditional approaches to video and VR eyewear. The setup can also display a multi-tasking dashboard that incorporates five or more typical screens, all while simultaneously providing the wearer a safe and clear view of their environment. The iOptik will be regulated in the United States as a Class II medical device, as normal contact lenses are. Google is rumored to be developing a medical device. 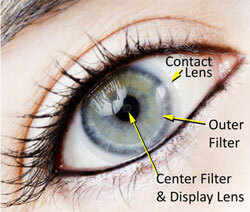 Could it be a next-generation of Google Glass that uses nanotech in contact lenses? Nanosensors that detect heart attacks before they happen could save both lives and money. That is exactly what Eric Topol, MD, at San Diego-based Scripps Health has been working on with Axel Scherer, PhD, of Caltech. Their technology involves tiny blood stream nanosensor chips that might sense the precursor of a heart attack. A person with such a tiny chip might get a warning on their smartphone or another wireless device that they should immediately see their cardiologist. The latest versions of the chip measure 90 microns--much smaller than a grain of sand. A doctor or nurse might inject the nanosensor into a patient's arm, where it would flow down to the distal tip of the finger and embed itself, screening the blood for endothelial cells that are sloughed off an artery wall in a precursory period preceding a heart attack. 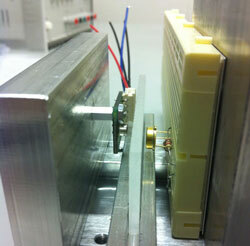 The sensors are now being used for glucose detection in animal studies. Human trials should follow thereafter. The combination of a nanosensor and coupled smartphone could be used be used to track autoimmune disease and cancer. It could also be used to screen for rejection in patients with organ transplants. In this application, the nanosensor could be calibrated to detect the donor organ DNA in the blood, which would begin showing up in the blood as an early sign of rejection. An array of antibiotic surfaces can be found in the natural world, inspiring scientists to develop man-made versions of them. A recent example of this trend can be found in research from Australian and Spanish scientists who have developed a nanomaterial out of black silicon with tiny spikes on its surface. 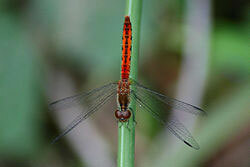 The surface geometry of the material is similar to that of the wings of an Australian dragonfly known as the "wandering percher," whose wings have tiny spikes that inhibit bacterial growth. In the lab, the scientists confirmed that the black silicon material proved to be effective against an array of Gram-negative and Gram-positive bacteria as well as endospores. The researchers report that the breakthrough is the first "physical bactericidal activity of [black silicon] or indeed for any hydrophilic surface." Researchers at Harvard University and the University of Illinois at Urbana-Champaign announced last year that they have figured out how to 3-D print miniature batteries about 1 mm across. The researchers, led by Jennifer A. Lewis, PhD, Harvard School of Engineering and Applied Sciences, created and tested materials, or "inks," able to function as electrochemically active materials. The materials also had to harden into layers in just the right way so they could be stacked up in layers during the 3-D printing--creating working anodes and cathodes. The recipe includes ink for the anode with nanoparticles of one lithium metal oxide compound, and an ink for the cathode from "nanoparticles of another." 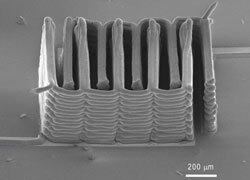 The printer lays the ink onto the teeth of two gold combs to create a tightly interlaced stack of anodes and cathodes. The whole setup gets packaged into a tiny container and filled it with an electrolyte solution to complete the battery. Tiny batteries could be game-changing for the medical device industry, finding use in applications such as biomedical sensors and skin-based monitoring devices. In addition, they could be embedded into plastic housing of devices such as hearing aids. Narayan says that he and his team are exploring the limits of 3-D printing. "Using a 3-D printing technique known as two-photon polymerization, we have created small-scale medical devices such as drug delivery devices and biosensors." They have also developed a biocompatible riboflavin-containing photoinitiator for two-photon polymerization of tissue engineering scaffolds. Two-photon polymerization uses lasers shining two different-wavelength beams on a sensitive material. Where the beams intersect, the material is polymerized. Then residual material can be washed out. Narayan continues, "I think that more biocompatible materials for 3-D printing, particularly for processes like stereolithography, microstereolithography, and two-photon polymerization, will facilitate wider use of these technologies for commercial production of medical devices." Scientists at the Multi-Scale Robotics Lab at ETH Zürich have developed a tiny magnetically-guided microbot designed to be embedded in the eye to perform precision surgery or to deploy precise amounts of drugs. The researchers demonstrated the viability of the technology in tests on rabbits. The robots used in the procedure has a diameter of 285 µm. The magnetic microbots are powered using external magnetic fields. Known as the OctoMag, the robots can produce magnetic forces and torques in three dimensions. The robot is so small that it could be used to help dissolve clots in the vessels of the eye. The size of autonomous microrobots has been historically limited by motors and propulsion devices. The OctoMag gets around this requirement by using an external magnetic control system that can guide a needle-injected device into the eye, eliminating the need to slice the eye open. On a closer horizon, Folk says, "There's a great company called Replenish Inc. [Pasadena, CA] that has an implantable micropump. You place it right behind the eye, and it releases this drug over time. And what's incredible about their technology is they've integrated sensor, pump, and wireless technology, all in something about the size of 2 quarters stacked up. They've already done their first in man - they placed it behind the eye, and they released the drugs over time." Swiss scientists have created nanotech-based electronic chips that are so flexible they can be wrapped around a hair strand. Based at ETH Zürich, the researchers were able to accomplish this feat by creating thin layers of stacked polyvinyl that are topped with an electronic circuit. When submerged in water, two of the polyvinyl layers dissolve, leaving a tiny circuit embedded in a sheet of parylene that is one micrometer thick. The researchers found that the transistors still function when wrapped around a human hair. 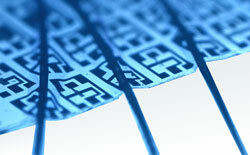 The flexible electronics can adhere to a range of materials. Potentially suited for wearables and a whole range of medical applications, the chip has already been used in an artificial eye and in a glaucoma monitor. Folk says, "The whole wearables space, you know, FDA's offered some good and clear guidance on phone apps. Where we are right now, wearables are generally a combination of accelerometers, gyroscopes and compasses. This is current technology; a lot of it is determined by the price point. There's actually a lot more that you can do, in terms of measuring things in a lot more sensitive fashion, but we're waiting for the price point to come down." "Wearables are the area everybody's talking about now," Folk said. "There's some cynicism understandably, but I think the capabilities of wearables are going to increase pretty rapidly. Then there are a lot of technologies that have been incubating for a long time. I think we'll start to see those roll out here over the course of the next few years. Some really cool, really different things are on the way. I think it's an area of tremendous innovation right now: I think that's really exciting." Carnegie Mellon University's Chris Bettinger and Jay Whitacre found that cuttlefish ink provides just the right chemistry and nanostructure to power tiny, ingested electronic devices. Bettinger, an assistant professor of materials science and biomedical engineering, and Whitacre, an associate professor of materials science and engineering, have been pioneers when it comes to finding battery substances that could be digested, allowing for the powering of medical devices that might also be eaten. They reported some success creating edible power sources using materials found in a daily diet, but still needed to find the optimal pigment-based anodes to include in their edible sodium-ion batteries. They ended up finding out that naturally occurring melanins derived from cuttlefish ink exhibit higher charge storage capacity compared to other synthetic melanin derivatives when used as anode materials. But not everything swallowed by a patient needs to be digestible. "You know, anybody who's ever taken a drug in their life probably hasn't adhered exactly to what the prescription says, or what the doctor says, so adherence is a very big issue in the industry," Folk says. "Proteus Digital Health [Redwood City, CA] is a very interesting company. They've got a pill with a power supply, a sensor, and a transmitter. And when you swallow the pill, your stomach acid kicks off the battery and initiates a signal. That indicates that you've actually taken the drug." Nanoparticles have proved useful for delivering cancer-killing therapies. Cornell University scientists, for example, were able to get tiny particles of gold alloy into the bloodstream and to cancer cells, where it can be heated up to kill them. The Cornell scientists chose gold -- No. 79 on the Periodic Table -- because of the ease in which it absorbs infrared heat. The researchers figured out how to attach the gold to colorectal-cancer-cell-seeking antibodies that delivered the gold to cancer cells. "It's a very, kind of cool, elegant solution," says Folk, "but gold's pretty inert, so what happens afterward? How is the gold taken from the body, and what organs is it interacting with? You have to look at the entire cycle." Meanwhile, MIT chemical engineers have designed nanoparticles that carry the cancer drug doxorubicin, as well as short strands of RNA that can shut off one of the genes that cancer cells use to escape the drug. The MIT researchers were searching for ways to treat an especially aggressive form of breast cancer. Silver nanoparticles are increasingly being used in everything from self-sanitizing toothbrushes to clothes. It may eventually be used in toothpaste. The ability of tiny particles of silver to kill bacteria has been known for some time, though the research appears to be light on whether the silver also carries health risks. CBC/Radio-Canada reports that the Washington, D.C.-based Wilson Center counts around 400 products presently using silver nanoparticles. Researchers at Western New England University have developed a nanotech-powered breathalyzer prototype that can detect acetone levels in the breath, which is theorized to correlate to blood glucose levels. The technology, if commercialized, could do away with the need for finger-prick-based testing of blood sugar. The ability to detect acetone in the breath is derived from acetone-sensitive nanometer-thick polymeric films. Exposure to acetone causes the two polymers in the films to crosslink, changing its physicochemical nature. The breathalyzer prototype is roughly the size of a book. The researchers are working on shrinking the technology to yield a breathalyzer with a similar size to those used by police to detect blood alcohol content levels. The Western New England University researchers' breathalyzer design is initially the size of a book. Scientists from the Technische Universität Dresden (Germany) and Fraunhofer Electron Beam and Plasma Technology FEP are actually working on a breath-analyzing spectrometer that is so tiny it can fit into a mobile phone. Narayan said the team recently published a paper on the use of a combination of two-photon polymerization and micromolding to make small-scale barbs for tissue joining." We are working with several companies on the commercialization of 3D printing technologies and on small-scale medical device processing. In general, we hope that these efforts will lead to new technologies for processing of medical devices that offer better functionality and longer lifetimes than current devices," Narayan said. Folk spoke of the pitfalls of tunnel vision. "If you don't have a broad view, it's really tough to see what else is going on. Venture capitalists and people like that, they have a broad view but they are looking for investment opportunities, and not always at technology creators," Folk said. One thing for medical device designers to think about, Folk said, is the intersection of different technologies. "I think one of the more interesting areas to look at, which I think is also one of the hardest ones, is to be looking at and anticipating intersections," he said. "You know, if I've got a technology I'm excited about, when I release in two or three years, how is that going to interact with the other things that are going on in the world at the same time?"